F., N., Esmaeili, S., Malekmohammadi, M., Hassanpour, A., Mosaddegh, M. (2014). Ethnobotanical survey of medicinal plants used traditionally in two villages of Hamedan, Iran. Research Journal of Pharmacognosy, 1(3), 7-14. Naghibi F.; S. Esmaeili; M. Malekmohammadi; A. Hassanpour; M. Mosaddegh. "Ethnobotanical survey of medicinal plants used traditionally in two villages of Hamedan, Iran". Research Journal of Pharmacognosy, 1, 3, 2014, 7-14. F., N., Esmaeili, S., Malekmohammadi, M., Hassanpour, A., Mosaddegh, M. (2014). 'Ethnobotanical survey of medicinal plants used traditionally in two villages of Hamedan, Iran', Research Journal of Pharmacognosy, 1(3), pp. 7-14. F., N., Esmaeili, S., Malekmohammadi, M., Hassanpour, A., Mosaddegh, M. Ethnobotanical survey of medicinal plants used traditionally in two villages of Hamedan, Iran. 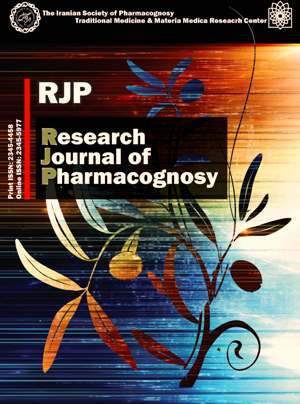 Research Journal of Pharmacognosy, 2014; 1(3): 7-14. 4Department of Traditional Pharmacy, School of Traditional Medicine, Shahid Beheshti University of Medical Sciences, Tehran, Iran. A notable amount of medicinal plants grow in Iran and local communities in different parts of the country have developed a deep knowledge of various uses of plants during their old history. Several ethnobotanical studies have been conducted by the Traditional Medicine and Material Medica Research Center (TMRC) to investigate the use of medicinal plants by local people. Some of these studies have been carried out in Kohgiluye va Boyer Ahmad, Azarbayjan-e-Sharghi and Golestan provinces. These ethnobotanical data have been collected by semi-structured interviews. In the present study, two villages of Hamedan province were investigated and eleven informants were interviewed. Our results have presented 45 traditionally used plant species, belonging to 23 plant families and 39 genera. Asteraceae and Fabaceae were the dominant locally used families. The plants were used both for medicinal and non-medicinal purposes and the most treated problems were digestive disorders and infections.